The people of Bulan have just celebrated their Fiesta from May 30-31. A town Fiesta functions as a bonding mechanism for it stresses the cultural traditions we have as one people, highlighted by events such as Miss Bulan Coronation Night, Bulan Basketball Championship, colorful parade and marching music, singing or dancing contest, different awarding ceremonies at the Plaza Rizal (now named as Freedom Park), the carnival with fairs and circuses, games and magicians, the visiting Ferris wheel (I prefer to call it fairy’s wheel), visiting market and vendors from all over Bicol showcasing their different products and food specialties and the many guests from the neighboring islands of San Jacinto and Masbate. As a boy I always enjoyed the town fiesta for somehow the whole town vibrates with life, colors, images and sounds-for my senses becoming magical. I was not involved directly either in sports, dancing or musical competitions nor was I a part of the town parade but somehow you feel you are a part of the whole thing. And I felt happy and excited, alive and proud. A town fiesta is like celebrating the birthday of the town. It is an event for everybody, rich or poor. Everyone is supposed to feel happy and proud, every Bulaneño. It is a time with friends and relatives and an opportunity to know other people. In my time in Bulan, when it comes to marching music, I remember with delight the Banda Duran, owned by Mr, Duran, whom I remember also served as a town councillor at that time and he lived somewhere there in between of the now existing Solis Institute of Technology and the Las Palmas Subdivision. When it comes to basketball, well , these were the Basketball dream teams of Bulan- and of my youth: The Warlords, The Lucky Guys and The Vigilantes! They dominated the basketball scene of Bulan at that time. I still remember the faces of their most famous players, the high scorers, the rebounders and the best forwards. But in Canipaan, there was once this young towering man with whom we used to play street basketball in Loilo Street who later made it in the 1980’s to the Philippine Basketball Association with the Ginebra Team, whose coach was the mercurial Robert Jaworski: He was Dante Gonzalgo. I already knew at that time that he would be a very good basketball player- and he made it to the top. Now about the beautiful side of the town Fiesta- the crowning of Miss Bulan. Well, young men were crazy at that time about the Miss Bulans. I was not for I was just a young boy then and there were only two Miss Bulans who remained in my memory: they were my cousins Aurora Salve Asuncion, daughter of uncle Salvador Asuncion of Canipaan and Cecilia Asuncion, daughter of my uncle Robert and auntie Terning Asuncion of Sabang. Yes, they were beautiful and graceful women of Bulan. A town Fiesta is therefore indispensable for it has many socio-cultural functions. It is the time when we celebrate as one people and recharge our battery after all the calamities that regularly visit Bulan and the hardship of daily life. We should use this collective event to strengthen ever more our solidarity and loyalty to our town and to our own people. Bulan is a 1st class municipality in the province of Sorsogon, Philippines. According to the 2007 census, it has a population 91,730 inhabitants. “The town of Bulan has a colorful and dramatic history which dates back to the pre-hispanic period. Legend, however, surrounds the name of Bulan.” The term “Bulan” in the local Bulaneño dialect, has several meanings. It may mean the month of the year, or the moon, or a luminary. According to a local historian, the great Valerio Zuñiga, the last meaning, taken in its truest intrinsic sense, is the more accepted term, due to the historical fact narrated by the “mga gurangan”, the old inhabitants of the town. They said that one night, a Spanish scouting expedition coming from the old seaport of Ticao, sailing northward and at the level of the seacoast of Otabi, saw a big and beautiful luminary, the moon, from the right side of their ship. Some of the natives who accompanied the Spanish explorers as guides and crew members, showed happiness and excitement when they saw the moon which radiated its silvery beams in the night. Asked by the Spaniards as to the cause of their excitement , they shouted, “Builan … builan” pointing at the same time to the moon which had caused their happiness. In memory of this happening, the Spaniards named the place, “Builan” when they landed. Another version goes that one moonlit night, two fishermen ashore were apportioning their catch when the Spaniards who landed in the place approached them for information about the place. Thinking that they were being asked about the full moon rising in the east, they answered, “Bulan”. Archaeological evidences point out that long before the coming of the Spaniards , the coasts of Sorsogonwere already thriving with communities of settlers dating back to as early as 4,000 B.C., when the Indonesians reached Southern Luzon. The archaeological findings excavated in San Juan, Magsaysay and Gate, which were evaluated to belong to the Ming and Sung Dynasty support the theories of historical researchers that the southernmost tip of Luzon, mentioned by Beyer and other historians, probably including Bulan, showed signs of civilization as far back as 960 A.D. Golden crowns, believed to exist from 91 B.C. to 79 A.D., were also excavated in Bulan. Historical records disclose that in 1569, an expedition led by Captain Luis Enriquez de Guzman and Fray Alonzo Jimenez, an Augustinian Friar , reached Sorsogon soil and found a small settlement of natives engaged in fishing and farming. This settlement was believed to be Otavi. It was in Otaviwhere Fr. Jimenez, together with Fr. Juan Orta, celebrated the first Mass in Luzon. On May 16, 1572, Capitan-General Miguel Lopez de Legazpi divided what is now Sorsogon Province into various encomiendas, and he allocated “Bililan” (Bulan) as a royal encomienda, which, together with “Uban” (Juban), has a population of 280 or 70 whole tributes. In 1583, the Franciscans began their evangelical work in Sorsogon. Subsequently in 1646, the Franciscans formed Gate as a visita of Bulusan. In January 1690, Builan was constituted as a pueblo civil and Gate was chosen as the townsite. Fray Diego de Yepes assumed administration of the town and at the same time its parish priest. He left Builan sometime in 1696. The growth of Bulan as a town, however, would be arrested as it began to suffer from the pressures of intense Moro raids in Sorsogon which lasted up to the middle of the 19th century. In 1746, a very devastating Moro attack destroyed Gate, which was 12 kilometers distant from the coast. Builan was plundered and razed to the ground. Scores of natives were killed and injured. Women and children were taken as captives. Those who were able to survive escaped the town, fleeing to the hills and hinterlands, abandoning the town totally. For the next 55 years Bulan was erased from the maps. Towards the latter part of 1799, a Spanish-mestizo from Casiguran, Don Agustin Camposano, came to Bulan to spearhead the re-establishment of the town. On January 1, 1801, the town was refounded along the banks of the “Mariboc River”, in what is now between Sitio Pawa and Barangay San Rafael. Builan, now spelled as “Bulan”, became a duly recognized pueblo under the Province of Albay, with Don Juan Vicente as the first “capitan” or “gobernadorcillo” and Father Manuel Bernardo as the first parish priest. The fortress of the old town, now referred to as “Banuang Daan” stands as a mute testimony to the dramatic rise of Bulan as a community. On May 15, 1801, Otavi was the first barrio recognized by the Municipal Government of Bulan. Later on, Gate, San Juan (Daan) and Buenavista (now part of Irosin) were recognized as barrios. Fifteen years later, sometime in 1815, a killer typhoon struck Bulan, killing many of its inhabitants, destroying their crops and properties. These forced many residents to move westward, to a safer place to avoid the imminent danger of the floods of the River Mariboc. On November 11, 1849, the Claveria Decree was issued in which new surnames for the inhabitants were adopted to facilitate identification. In 1850, this decree was implemented in Bulan. The families of Bulanwere given new family names, most of which start with the letter “G”. In 1866, the municipal officials of Bulan decided to transfer the town to its present site. A cofradia, formed by Fr. Francisco Roque, was headed by Don Marcial Gillego, the capitan-municipal and an architect. This cofradia (religious confraternity composed of prominent citizens), was given the task of management in the planning and construction of the new town. In 1883, a cholera epidemic, the worst catastrophe to hit Bulankilled 810 persons or 22 percent of the population in a 3-month period. Many prominent citizens also died during that time. Since its founding, and despite some unhappy events in the life of its people, the town continually and steadily began its rise to prosperity. It surpassed other towns in terms of economic activities, and rivalled with the premiere seaport town of Sorsogon. It was now an important and crowded seaport engaging in commercial trade with seacoast towns of Samar and the islands of Ticao and Masbate, the neighbouring towns in Sorsogon and the city of Manila. 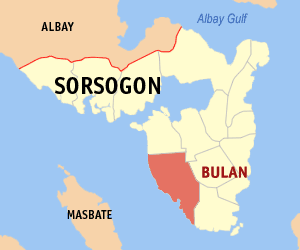 By the time Sorsogon province became independent from Albay, in 1894, Bulan’s population rose to 11,000. The big Spanish firm engaged in copra and abaca export, the Gutierrez Hermanos, from Manila, established a town branch. Many Chinese traders resided in Bulan. While Bulan was spared the bloody turmoil of the 1896 Revolution, the Spanish Provincial Government undertook measures to preempt revolutionary activities in the towns, and placed under surveillance all persons suspected of bearing sympathy to the revolutionary cause. Arrests and imprisonments took place. In October 1896, Don Teodoro De Castro y Zabala was arrested and incarcerated in Bilibid, because he was found in possession of letters written by anti-Spanish natives in Manila. Don Zacarias Asuncion and other residents suffered the same fate, for having no cedulas personales and for singing anti-Spanish songs. It should be noted here, that on January 4, 1897, one of the sons of Bulan, Father Severino Diaz, a priest at the Nueva Caceres Cathedral, was shot in Bagumbayantogether with 14 other martyrs. They are now referred to as the “Martyrs of Bikol”. In November, 1898, Bulan was visited by three ranking revolutionary leaders, General Jose Ignacio Pawa, General Vicente Lukban, and Col. Pedro Aguinaldo. They declared Bulan under the New Philippine Republic. Elections were also held that year. On January 21, 1900, at the height of the Philippine-American War, the Americans landed in Bulan. The American soldiers were under the command of Captain Charles Mclane and Lieutenant B.P. Dishky, of the A and B Company of the First Battalion. There was no resistance from the town. In fact, through the efforts and initiatives of the principales of Bulan headed by Don Rufino Gerona, the pacification campaign in Sorsogon gained ground. It was Don Rufino and company who caused the surrender of Col. Emeterio Funes, a provincial revolutionary leader, in 1901. Not to be forgotten during this period between the First Philippine Republic and the American Occupation is the name of Don Julian Gerona, an illustrious son of Bulan who figured prominently in national affairs. He was a friend of Rizal, Mabini and other revolutionary leaders. He also later on became the first Secretary to the First Philippine Assembly of 1907. The name of this Bulaneño will be etched in the annals of Philippine history. Under the Americans, the community of Bulanflourished. Education, trade and commerce, politics and religion were given ample freedom to prosper. The people started organizing labor unions, political parties and community movements. The setting up of womens’ clubs as the Club de la Mujer, and the Jota de Leche and scouting movements were encouraged. When the Second World War broke out, the Japanese Forces occupied Bulan in December 13-14, 1941. Bulan at first offered no resistance to the Japanese invaders who held camp in various parts of the town. Many young soldiers and officers from Bulan though, fought in the battlefields of Bataan and Corregidor. Many lost their lives and did not return back. Those who survived Bataan, Corregidor and the Death March came back, organized guerillagroups and fought sporadic battles with the Japanese. There were also incidents of deathat the hands of the Japanese Imperial Army, especially that of the thirteen men, mostly Chinese, who were executed in Gate in June 1942. It was also a sad period that the guerilla groups in Bulan were divided into two major factions, the Lapuz group and the Escudero group. Many soldiers and citizens died, suffered and became victims to this bloody rivalry. With the coming of the American Liberation Forces, the guerillas eventually united, but the town of Bulan was burned by the Japanese forces who retreated to Magallanes. There were many atrocities committed during this time. Bulan was liberated from the Japanese by October 1944. The air-raid shelters and wartunnels at Imelda, Sta. Remedios, Layuan, San Francisco and other places remain as grim reminders of that dark period in Bulan’s history. The process of reconstruction and rebuilding of the town took place after the Liberation. The people of Bulantook to the task, as withother communities in the Philippines, in an effort to regain what was lost during the war. Politics was lively, as with socio-economic activities and religion. Schools flourished, barrios were organized and constituted, citizens’ organizations grew, population increased. By 1960, there were 54,180 persons recorded, up from 13,431 in 1903. By 1972, there were already 63 barangays in Bulan, compared to eleven in 1900. The declaration of Martial Law in 1972 proved to be another chapter in the history of Bulan. It was a period of uneasy predicaments. During these times, many young students from Bulan became involved in activism espousing socialist and radical change. It was brought about by excesses in politics and government, and a desperate look at the deterioration of the quality of life in many levels of Philippine Society. At first, the people of Bulan welcomed the declaration of Martial Law and its promise of a New Society. But as the turn of events deteriorated, people became fearful of the times. From 1973 to 1975, the far-flung barangays and sitios, especially the isolated ones, notably Gabod, Marinab, and the northern barangays became virtual battlefields of the warring government military forces and NPArebels. There were reports of atrocities by both sides, and many barangay residents fled their homes to escape being caught in the crossfire. Proof of this was the rapid decline of population in barrios. Up to the present, there are still pockets of armed resistance offered by the NPA in the hills and barangays of Bulan. Prominent names of Bulan citizens who joined the rebel movements of the 1970’s were the late Antonio Ariado, Ms. Nanette Vytiaco and many others. In the 1986 EDSA Revolt, a son of Bulan stood out in the national scene. Hw was Colonel Gregorio “Gringo” Honasan, who later on became a rebel military officer and then a Senator of the Philippine Republic. The events of 1986 brought new changes in local leadership and in the aspects of Bulan’s community life. In the year 2001, Bulan celebrates her 200th year anniversary or bicentennial, since being refounded along the banks of the Mariboc River. Through the years, Bulan was able to withstand the tests of time, thanks to the resiliency and grace of her people. Bulantoday stands proud for her history and yet humble with the lessons of time. She is now at the forefront of rapid socio-economic and political changes confronting many communities of Philippine Society and in a few years, she will perhaps be Sorsogon’s foremost town. The People of Bulan, a product of the complicated interplay of time, events, race and culture, exudes a character bothcomplex and simple. It is this character that makes him bothreligious and irreverent; stubborn, courageous and proud yet warm and accommodating. He can bend withthe wind but remain strong as not to break. And this character has carried him through both fortunate and difficult times. The People of Bulan has been shaped by the events of history and has himself shaped history. It is this that will carry this people on, this town on, to the next millennium. The Municipality of Bulan is strategically located at the southwestern most tip of the island of Luzon and is a premier town in the Province of Sorsogon. It has an area of exactly 20,094 hectares and is the terminal and burgeoning center of trade and commerce of its neighboring towns. It comprises fifty-five (55) barangays and eight (8) zones and is populated by people of diversified origin. This municipality is bounded on the North by the Municipality of Magallanes, on the East by the municipalities of Juban and Sorsogon, on the South by the Municipality of Matnog, and on the West by Ticao Pass. It has a distance of 667 kilometers from Manila, 63 kilometers from the province’s capital- Sorsogon City, 20 kilometers from the town of Irosin, Sorsogon and 30 Kilometers from the town of Matnog. Residents of the Bulan is now looking forward on its cityhood because of its rapid-economic growth considering the fact that it is sited as the richest municipality in the province and 5th among the 1st class municipalities in BicolRegion with an average annual income of Php 58.8M. If it happens, Bulan will be the second city in the province and will be the 9th in the region. Major export of this town are from its coastal waters, agricultural lands produce copra, abaca fiber. Most of the revenues come from the fishing port of Bulan and businesses. There are three commercial banks in Bulan with two ATM. These are the Philippine National Bank, Metrobank (withATM), and the Allied Bank(with ATM), and Rural Bank of San Jacinto, Masbate. There are also lending institutions like Intertrade, GSAC, and FALPSI that are very popular to SMEs. The Primary Education in Bulan are divided into two Districts, The Bulan North District comprising all the Barangays towards the North coastal Barangays, to the interior land locked northern Barangays. The Bulan South District comprises the southern Coastal Barangays. Bulan has many secondary educational institutions. The Largest public high school is Bulan National High School. Formerly, it was the Bulan High School/Bulan Vocational High School, before the former was converted in to Sorsogon State College Bulan Campus. BNHS has satellite Campuses at Barangays Otavi, Beguin, J.P. Laurel, San Juan Bag-o. There are various private secondary schools. The St. Louise De Marillac School (Formerly Colegio de la Inmaculada Concepcion) a Catholic school run by the Daughters of Charity religious congregation, Saint Bonaventure Academy of Butag, the Southern Luzon Institute-Kenerino Ramirez Asuncion Memorial School (SLI-KRAMS), Solis Institute of Technology, and A.G. Villaroya Technological Foundation Institute. Bulan is politically subdivided into 63 barangays. hi i am jeffrey i grew up in manila but have roots in bulan. I learned that my great great grandfather rodolfo asuncion sr. is a son of zacarias. I wanted to know more about the line in the entry above stating that zacarias was among the many bulan residents persecuted by spaniards during the Revolution. would just like to know the exact details of what transpired that led to his detention. I presume this was the factor which led him to stay in pasig afterwards. Hi Jeffrey, nice that you dropped by. May latest post The Asuncions In Politics… is my reply to you. Best regards and happy Fiesta to Bulan people! My hometown. I am from brgy Otavi. Excited to go home this coming july 9,2015. belated happy fiesta bungto. Kumusta na tabi an intiro gabos. My hometown. Hi! I ‘am from Managa-naga . Now I know that one of our great great grand father JULIAN GERONA was a friend of RIZAL and MABINI, and I learned too that my great great grandfather RODOLFO ASUNCION SR. is a son of Zacarias. I wanted to know more about the line in the entry above stating that Zacarias was among the many Bulan residents persecuted by Spaniards during the Revolution. ,hain tabi an high school san Quezon (Cabarawan)? Wara nabanggit. ,Hain tabi an Quezon (Cabarawan) National High School. Mao lang tabi un an costal high school na nakabutang sa taas san bulod nan sa durho pa san Bulan.